An image from the Michael Trigilio’s video art. Space travel. Resistance. Transcendence. A serialized science fiction novel comes to life in an other-worldly video installation by UC San Diego Professor Michael Trigilio. “A Glimmer Exodus Sketchbook,” which opened Thursday at the Qualcomm Institute‘s gallery, chronicles the departure from Earth of the “Glimmer,” a group of visionaries, radicals and creators who connect with a cosmic intelligence and set out to a create a new world. Since 2017, Trigilio, an associate teaching professor in UC San Diego’s Visual Arts Department, has been developing a long-form narrative project based on his serialized science-fiction novel Glimmer: Verse One of the Blockchain Elegy. The works in the exhibition are “sketches” that illuminate the sounds, landscapes and vessels in the novel. The 12-minute video depicts the Glimmer leaving Earth and eventually surveying and settling a new world. 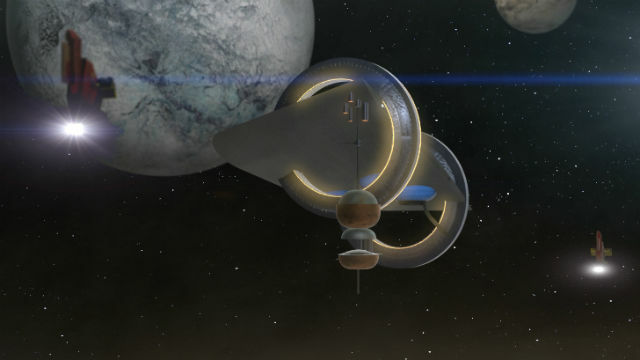 The complex, asymmetrical spaceships are “so far in the future as to be incomprehensible,” said Trigilio. There are voice-overs, but no humans in the video, because it isn’t meant to be traditional science fiction. The exhibition is part of the Qualcomm Institute’s efforts to bring together technology and art as part of its interdisciplinary research mission. The gallery@calit2 in Atkinson Hall on the UC San Diego campus is open from noon to 5 p.m., Monday through Friday. Admission is free.